I spent the summers following my first two years of university playing concerts in various community settings across southwestern Ontario, with an ensemble called Different Drummers (why does that name sound so lame now?). The group operated under the auspices of the Opportunities for Youth program, a student summer employment initiative of the provincial government. 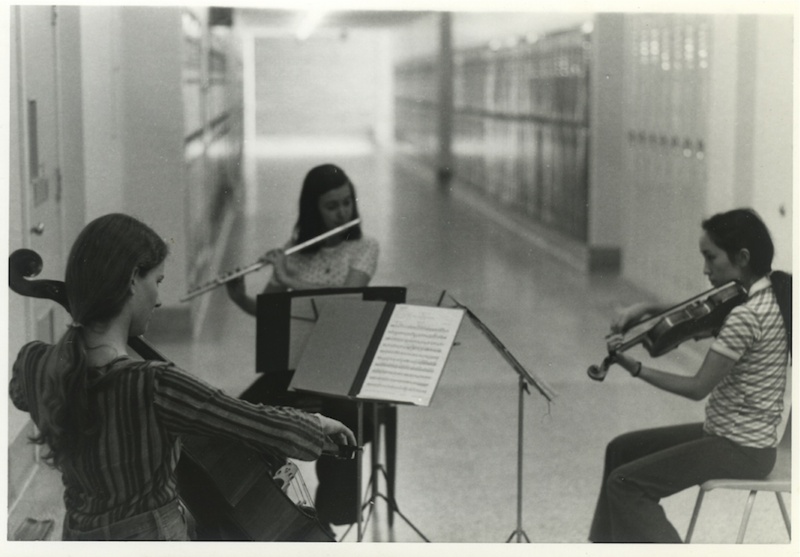 We were a motley bunch of musicians, drawn from various points on a wide-ranging web, and our core instrumentation was violin, viola, cello, guitar, flute/recorder and piano. Our eclectic programming was an attempt to realize the noble but impossible goal of playing ‘something for everyone.’ We varied our shows but a typical one might include some Bach keyboard music, a movement of a Mozart string trio, a Scott Joplin rag, some Farnaby and Byrd, Monti’s Czardas, a couple of folk or folk-pop songs, and something from the contemporary ‘art music’ world. We did a lot of arranging to suit pieces for our instrumentation, occasionally with hilarious results. (Yes, the audiences thought so too.) Our extraordinary manager/administrator/chief financial officer/roadie was a guy named Greg Dovlet, and our home base between run-outs was a mid-city junior school not in summer use. For young musicians training in a typical classical music school, the concepts of what audiences are like and how a performer should behave can be very skewed. 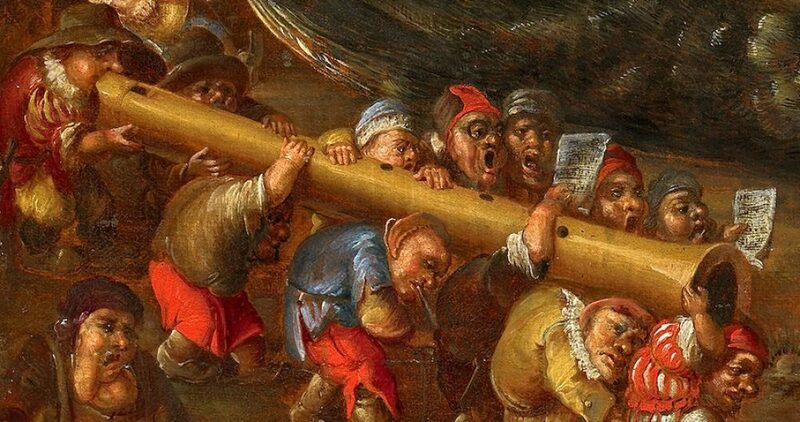 You expect everyone to sit quietly and politely, for example, and/or you expect that a concert will be played in the order printed in the program; but neither of these expectations carry much weight in the worlds of Other Music Lovers. If you have the opportunity to play shows for audiences very different from the ones that frequent concert halls, you’re given a tremendous chance to remedy that skewing and to learn how to play for the rest of the world. That’s the opportunity we had for those summers, and it was a huge gift. During the first summer we played at kids’ summer camps, hospitals, hospices, long-term care facilities, mental health centres, senior citizens’ residences and community centres, and a couple of jails. Based on those jail experiences, Greg’s proposal for the following year focused our activity on correctional institutions. Though we still performed for a few audiences of seniors or children who were free to leave when the show was over, we spent that second summer playing at detention centres, halfway houses, and minimum- and medium-security prisons around southern Ontario. We would usually play two shows in one larger venue, or two or three different places in one day. We played at Toronto’s Don Jail several times, in the chapel in the old section of the building, and at various other places, the names of which we’d only heard of in the news. In Penetanguishene’s facility ‘for the criminally insane’ (as it was called at the time), we played for an eerily dulled bunch of people who clapped and smiled but were completely silent – and then later that day we played at the non-correctional psychiatric hospital where we got exactly the opposite response. There the audience got up and danced, sang along, wandered, or came up and had a chat while we were playing (and playing the flute makes it a bit difficult to respond ). The Orange Blossom Special was particularly special that day, as one audience member leaped to her feet and danced in a frenzy of delight that impressed her caregivers, and that most of us ‘sane’ people would never think of showing. One day we travelled to a medium-sized city where the jail warden was a total jerk, the kind of guy I thought only existed on TV crime dramas. His staff were only slightly less obnoxious, and the atmosphere in the place was palpably angry. I couldn’t imagine being in that place for months on end without learning to hate the world even more than you did when you arrived. 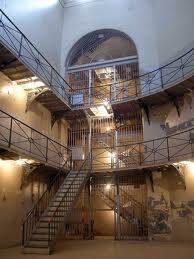 We played in the central area of the jail, next to the huge wrought iron staircase and amongst the cells, but the cell doors faced away from us and so the inmates couldn’t see us while we played. This was the only instance all summer where we couldn’t see our audience, which was very disturbing, and not surprisingly there was lots more heckling than usual in that show. Later that day, we drove half an hour southwest and played in the courtyard of a smaller jail where the warden and the staff treated the inmates as they’d like to be treated themselves. The atmosphere there was diametrically opposed to what we’d experienced in the morning. That was a very educational day. Yes, there was always heckling; but the hecklers were relatively few, and there were also attentive non-hecklers who listened, watched, clapped, asked for more, asked questions, and sometimes even yelled at a heckler to ‘shut the #$@% up!’ From a performer’s standpoint it was a really important learning situation – we just kept playing despite ridicule, insults and sexist remarks being yelled at us. One of my colleagues was a beautiful Rubenesque blonde and therefore a particular target for the latter kind of attention, and I don’t know how she managed. We’d all be targeted at one time or another. As for the music, some inmates thought Mozart sucked, some people hated songs by Gordon Lighfoot, but the big surprise for me was that very few people in the prison population took offense at Byrd or Farnaby. Definitely not what I’d expected. When friends heard where we were playing that summer, they’d ask, ‘So, what’s it like to play for a captive audience (har har har)?,’ which is what we got asked at pretty much every institution too… But when they asked what jail was like – as if I really knew at all – my answer was usually, “Best to stay out of it.” In some prisons you got the impression that the people doing time were being encouraged to change their life trajectory, to imagine other possibilities for themselves, and treated with dignity despite having made some extremely bad choices in the past. We’d all want this if any of us found ourselves in their situation. In other places the atmosphere was so thick with the psychological grime of the ‘us vs. them’ game, you’d want to take a shower when you left. I remember wondering what the maximum-security places were like, but it’s probably for the best that I never found out. Of course our experiences were minimal and very restricted, and we only understood a tiny part of the complex whole, but the project was one none of us will forget. It was a disturbing, confusing, eye-opening, fascinating and rewarding summer. I’d like to pay a particular tribute here to the late Greg Dovlet, who died unexpectedly a couple of years ago. Thanks for everything, Greg, and for all that you were.